Quite often, when you walk into a spa, salon or studio, there is this implied sense that you must suddenly be Zen. Enya fills the air. The decor is either in muted tones or reminiscent of old Hollywood. And everyone is quietly contained, making sure not to make eye contact or crack a smile. This is not Bluffton Lash Lounge. Instead, Bluffton Lash Lounge plays music that, though chill, you can groove to. The colors are vibrant yet cozy and very much bohemian. And everyone, while respectfully quiet, exudes this “you-go-girl” energy. In short, it’s rejuvenating and reinvigorating all at the same time. “And many of our clients become our friends,” added Jenifer Locklair, also co-owner of Bluffton Lash Lounge. 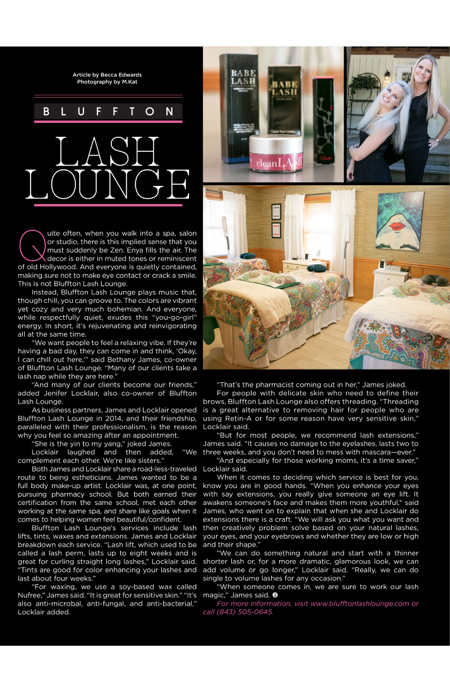 As business partners, James and Locklair opened Bluffton Lash Lounge in 2014, and their friendship, paralleled with their professionalism, is the reason why you feel so amazing after an appointment. “She is the yin to my yang,” joked James. Both James and Locklair share a road-less-traveled route to being estheticians. James wanted to be a full body make-up artist. Locklair was, at one point, pursuing pharmacy school. But both earned their certification from the same school, met each other working at the same spa, and share like goals when it comes to helping women feel beautiful/confident. “For waxing, we use a soy-based wax called Nufree,” James said. “It is great for sensitive skin.” “It’s also anti-microbal, anti-fungal, and anti-bacterial,” Locklair added. “That’s the pharmacist coming out in her,” James joked. For people with delicate skin who need to define their brows, Bluffton Lash Lounge also offers threading. “Threading is a great alternative to removing hair for people who are using Retin-A or for some reason have very sensitive skin,” Locklair said. “And especially for those working moms, it’s a time saver,” Locklair said. “When someone comes in, we are sure to work our lash magic,” James said. For more information, visit www.blufftonlashlounge.com or call (843) 505-0645. Service COVERT STYLE. Why Settle For Less?